Gone are those days when you use traditional wood burning brick fireplace, which requires regular attention, maintenance and servicing but nowadays things have changed. Technology has impacted in all sectors hence the birth of electric fireplaces. 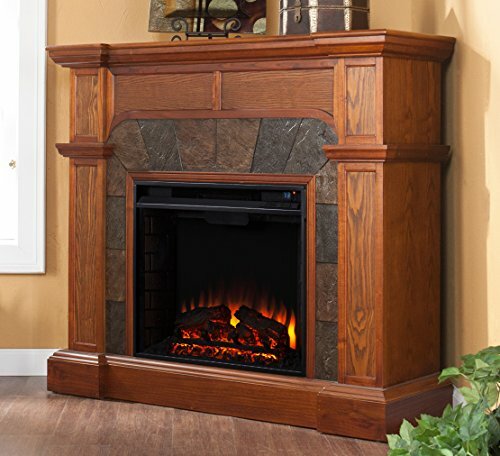 With the Best Electric Fireplace Mantel Package, you will enjoy glowing coals and soft rolling flames that give you warmth. Therefore, if you are looking for a fireplace that can do more than just function as a fireplace, we have got some great ones for you. 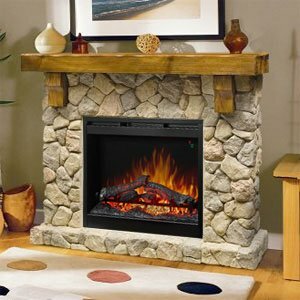 We have gathered this list of the best electric fireplace and hope you’ll be able to grab the one that best suits your requirements. In this buying guide, we’ll also review some of the vital points to consider when buying an electric fireplace for your home, as well as the benefits and drawbacks. If you’d like to introduce a lively vibe to your rooms, the Dimplex SMP-904-ST Fieldstone Electric Fireplace will do precisely that for you. 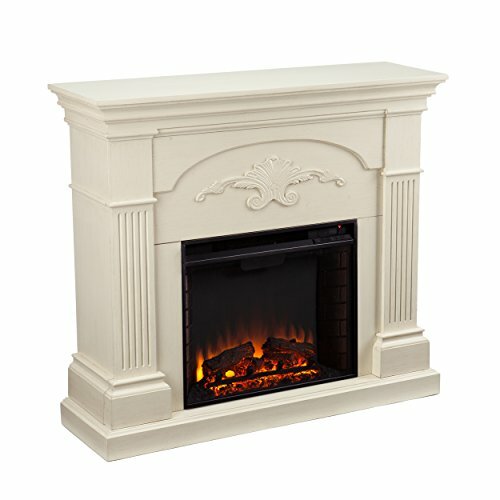 This unit comes with a 26″ self-trimming firebox that can be operated with or without heat and uses patented faux flame effect to produce a life-like flame effect. Dimplex SMP-904-ST is crafted using commercially-grade MDF plus a lasting laminate coating that gives it a professional appearance. The convenient remote control facilitates easier adjustment and regulation of the flame intensity, the color option, and the heat output. This saves time than using the manual control found on the body. 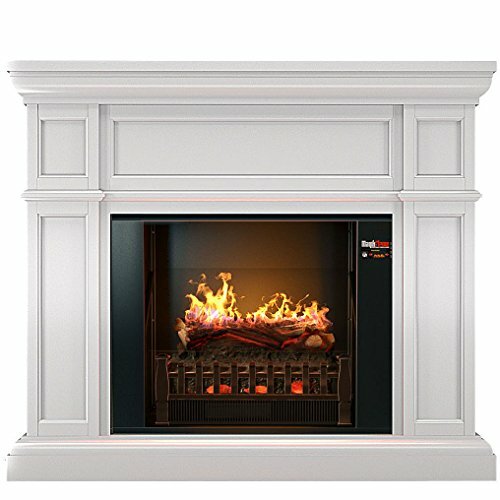 The electric fireplace works in any place that has an existing fireplace and a standard household electrical (120V) outlet. This unit produces 4,915 BTUs of supplemental heat and helps you maintain comfortable room temperature. Turn the dial clockwise to enable the heater and set your preferred temperature. Once the room attains an ideal temperature, turn the knob anti-clockwise to program the heat setting. Installing the unit in your home is a simple and easy task that you can carry out on your own. A 26″ self-trimming piece is what you get after you’ve installed the firebox into its place. 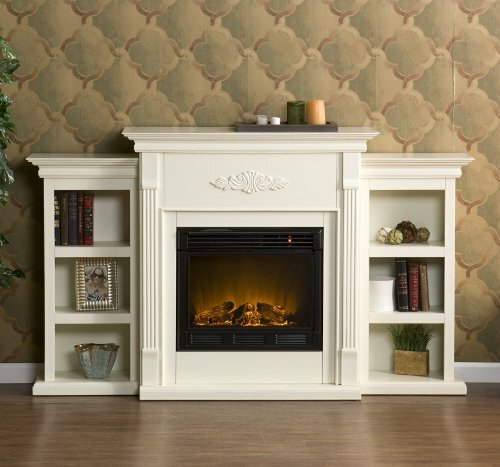 This great-looking fireplace will complement any living room décor where you wish to establish a masonry look. Power: 120 volts, 1,440 watts, and 4,915 BTU’s. You can operate this unit with the flames OFF or ON or with the heat OFF or ON- all depends on your decision. The mantel on top of this fireplace can hold flat-screen TVs as wide as 42.75 inches and 85pounds of weight. The remote control, flame brightness, and adjustable thermostat are some of the features that make all the system operations more comfortable. The slim, compact design of this unit makes it easy to transfer from one room to another where you want to feel the faux flame and warmth effects. You do not need an electrician or contractor to install this appliance. Just plug it into the regular 120V socket to start enjoying the show. The glass panel located at the front is cool to touch and thus safe for kids. If you want to amaze your guests and family, this beautiful electric fireplace is the right unit for you. The Fredricksburg is the most unique of the group due to its included shelving pieces that are included. The shelves are free-standing pieces that are meant to be placed against each side of the electric fireplace mantel. The shelves offer a large amount of storage although there are no holes to run wiring through so electronics won’t be ideal to be placed within. The design is very classic and should fit in with almost any decor. Also, since it’s fairly reserved its design should stand the test of time. This unit is easy to assemble and a bargain for the quality. MagikFlame is a little different than the other manufacturers. They play at a higher level. This also means that they’re not cheap but they are competitive with other high end manufacturers like Dimplex. 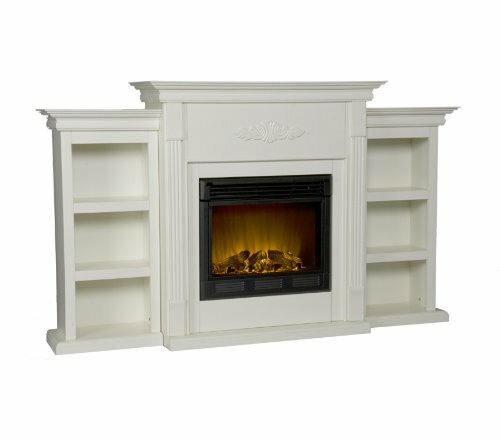 The Artemis is a LARGE fireplace and mantel unit. 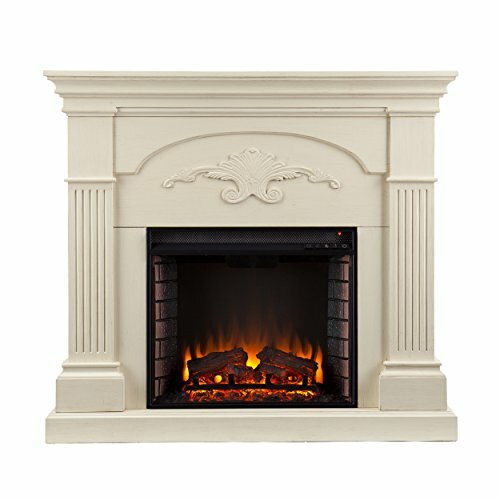 It is very well constructed and has a very high end fireplace display. It’s most definitely a quality product. A unique differentiator is that it comes with a touchscreen remote AND an app you can use to control the many settings for your smartphone. MagikFlame also provides a 3 year warranty which is very impressive and much more than the typical competitor warranty of 1 year. They claim it to be the most realistic electric fireplace on the market and while it is quite good I find the Dimplex Opti-Myst to be more realistic but that’s my personal opinion. If you are styling your bedroom or living space and thinking of a focal point that will be attractive, then the Cartwright electric fireplace is a mantel package that has all your wanted needs. This fireplace is called a convertible because of its added flap, which allows the system to stand flat against the wall or corner. Featuring a remote-control adjustment giving you that free feel use of this device. It also comes with a timer you can automatically pre-set this fireplace for a specified period. You can also use this device without a heater throughout the year without experiencing any issues. This fireplace can provide supplemental heat in a 400 square feet range once the desired temperature is achieved. The SEI Cartwright Electric Fireplace can be used as a console stand for your 43.5″ flat panel television. Size is a crucial aspect to consider when buying an electric fireplace. This appliance comes in a large variety of sizes with different models designed to fit in any space. The size of your fireplace should be directly dependent on the size of the room you wish to install it. How much are you willing to spend on an electric fireplace? Different units come with varied prices, so acquire the one that matches your budget if you plan to introduce an electric fireplace to your home. How much power does the unit consume? Have you confirmed the manufacturer’s claims with the reviews from previous buyers? Buy the electric fireplace that saves you energy bills throughout the year, not a liability that keeps raising your energy bill. The primary purpose of buying an electric fireplace is to warm up your room and house. If the fireplace does not perform this task efficiently, then it doesn’t worth investing your hard-earned money. Different electric fireplaces come with varying heating capability, so make sure that the device you are buying has the best heat capacity. Warranty and support are essential. There are potential to be an issue as with any electronic device, so it’s vital to know what kind of warranty that’s offered. Good product always comes with a warranty that protects against any defect. Are you still wondering whether an electric fireplace is an excellent choice for your apartment? If yes! Here are some benefits associated with an electric fireplace that will make you feel like having one. You do not need to clean up ash or soot. No chopping or hauling logs. All you need is clean the dust off the surface regularly like you would with any other piece of furniture, change the light bulb every couple of years if required and you’re good to go. Electric fireplaces don’t produce any harmful gasses and don’t burn fuel in the air. This unit help keep your home safe from the risk of fire because they don’t use real fire. Electric fireplaces offer a wide range of design options at your fingertips from modern wall-mounted models to traditional models with mantels. These appliances come in all kinds of styles so that you can easily match them to your home’s décor. Electric fireplaces are very energy efficient, cut costs, save money and won’t add much to your monthly bills. They cost pennies and allow you to heat only the areas of your home that you use the most. In most cases, the installation details depend on the selected fireplace style. You don’t need to perform massive renovation just to install your electric fireplace. All you have to do is plug them in. No chimney or vents are required, just an outlet and enough space. This buying guide will help you to find and make the most of your new fireplace whether you want an ultra modern looking focal point for your room or you want to add the look of a traditional heating appliance to your home. We guarantee you that you’ll be fully satisfied with any unit you buy from this list. 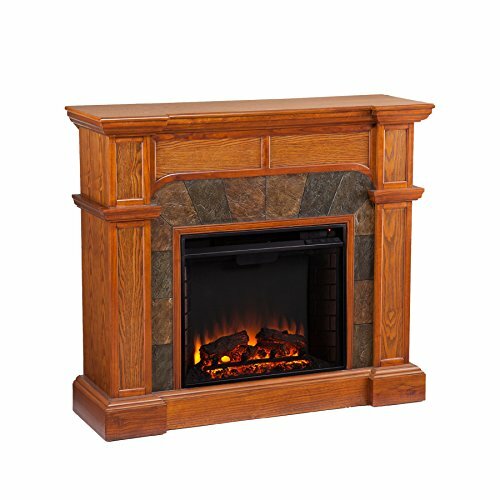 However, our entire selection of the Best Electric Fireplace Mantel Package is available online, and worth a look. Thank you for your time, and we hope you like our electric fireplace review and found it useful. Staff writer @PlugInFlames.com - Edward loves his pet turtle Rodrick and has an unnatural fondness for the color orange however his knowledge of electric fireplaces is unrivaled.